"The Acer Aspire 7552G-6436 is one of those systems that will impress the average computer buyer even if more advanced users will be disappointed with it. It has a big 17.3″ display and a full size keyboard making it really a good desktop replacement. You won't be satisfied if you want a lightweight, portable system or want a world-class keyboard. But for people who just want a decent computer to put on a desk and then occasionally take with you, the 7552G is a good option." 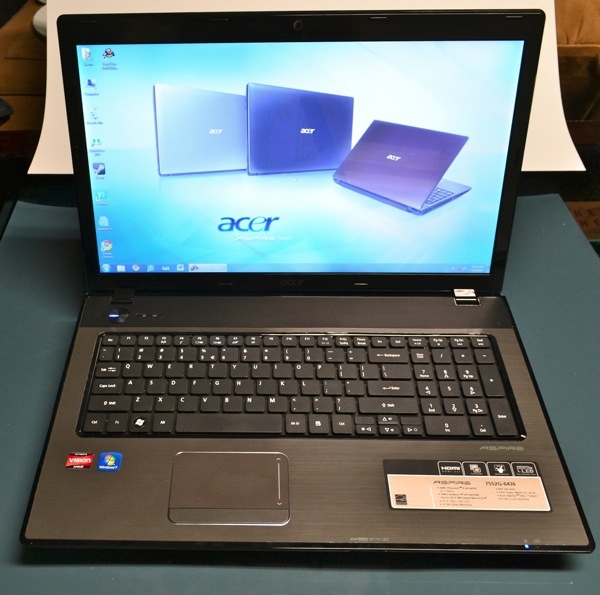 Designed to be used (mostly) as a desktop replacement, the Acer Aspire 7552G-6436 has some decent specs, an above average but annoyingly glossy screen, with a resolution of 1600x900, and is said to be great for watching movies, making videos, editing photos, and some light gaming. At just over a sturdy 7-pounds, it is transportable, and, as the author says, it doesn't feel "dainty." The keyboard is comfortable, but reportedly a bit mushy, and the touchpad is simply too small for the available space. Use a mouse! Processor performance is slightly above average. Speakers are "nothing special." Battery life during testing was under 2-hours, so this is not a system to buy to be used untethered, and, if you do (or must) try it, it has a huge power brick to drag around. A huge plus: list price on Amazon is currently $669.99. Not a top-of-the-line desktop replacement, but a good value for the price. My biggest concern with this system would be Acer's reliability and service.